D & S Vending Inc - ASMMS272KW - All-State Micro Market Kiosk/Stand Kit- Walnut, 78" x 27" x 12"
Home → Vending Machine Parts by Manufacturer → All-State Micro Market Stands → ASMMS272KW - All-State Micro Market Kiosk/Stand Kit- Walnut, 78" x 27" x 12"
All-State Micro Market Kiosk/Stand Kit- Walnut, 78" x 27" x 12". 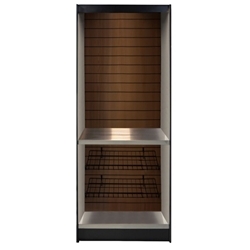 Can be used as a pay station, coffee station or a microwave station with ample space to display point if sale merchandise. Built with durable double wall steel construction. Vinyl clad steel slats with walnut finish. LED light for better product display included. DISPLAY KIT WITH 6 SHELVES, 6 BASKETS AND 12 OF THE 8" PEGS INCLUDED. Must Ship TRUCK and arrives fully assembled.